El Pinto has free music all summer. Each Tuesday and Thursday night from 6:00 - 9:00 p.m. we have amazing talent performing on our outdoor patio stage. Be sure to enjoy the best margaritas in the Southwest. Happy Hour in the Cantina begins at 4:30 with $2 off all food on the Cantina menu and $1 off drinks. 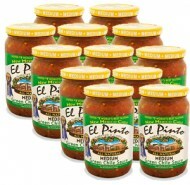 Our non-GMO chips made at El Pinto with Celtic Sea Salt and fresh salsa are always free. Our Fresh Made House Margarita is made with a premium 100% Blue agave tequila (ask your server for the tequila of the month), Citronge, house made simple syrup, and fresh squeezed lime juice. Outside the live music begins at 6:00 p.m. for free on Sandia Patio. We will see you at the best spot for Happy Hour and live music during dinner in Albuquerque. BALLOON FIESTA SPECIAL: Mariachi's from 6-8 pm nightly Oct 5th to 13th.